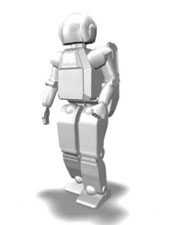 ASIMO was introduced to the world October 31st, 2000. This engaging humanoid robot is the result of fifteen years of research and endeavor by Honda Motor Co., Ltd., a company dedicated to expanding and enhancing human mobility. ASIMO's very name is an acronym that highlights its revolutionary mobility... Advanced... Step... in... Innovative... MObility... A-S-I-M-O. ASIMO is the world's first humanoid robot to walk dynamically, as humans walk ... to walk forward AND backward, to turn while walking, and even to climb and descend stairs with grace and ease. In a world full of high curbs, uneven surfaces, obstacles and stairways, a robot must be able to navigate easily around these barriers so that it can assist human beings. That's the vision behind ASIMO...that similar robots will improve the quality of life for humans by assisting the physically challenged and the elderly as helpful companions. ASIMO has toured the country in an original stage production to introduce families and students to humanoid robots in a positive, fun, and friendly way. The highlight of the show is when ASIMO takes on the challenge of climbing and descending a set of stairs. And, Honda engineers continue to improve ASIMO's capabilities. ASIMO's latest intelligence technologies include voice and facial recognition, digital mapping of its environment, gesture and posture recognition and Internet connectivity. The application of these technologies will all be necessary for ASIMO to one day operate effectively in our world, allowing ASIMO to interact with humans in a helpful manner. ASIMO, we salute you on your induction into the Robot Hall of Fame!